The Pathfinder Chronicles Campaign Setting is probably one of the best setting books that I have seen in the past few years. The official Pathfinder RPG campaign setting is the world of Golarion, where all the Pathfinder Adventure Paths and Pathfinder Society modules take place. Golarion and its cosmology truly offer something for everyone. Golarion has it all: steampunk, horror, sword & sorcery, sword & planet, dark fantasy, political intrigue, Vikings, genies, pirates, ninjas, dinosaurs, and lasers. The surprising quality is Golarion manages to provide all this yet still feel very homogeneous and flowing. The key to the setting’s consistency (other than the A-list of developers Paizo had working on it) is Golarion’s familiarity. The world of Golarion is structured, shaped, and colored with the same elements that comprise our own Earth. Golarion’s Inner Sea is a rough translation of the Mediterranean with all the various surrounding cultures being transposed upon Golarion’s landmasses with a fresh perspective. This was actually a goal spelled out in the prologue titled, An Old New World penned by Mike McArter, the editor and project lead. The campaign setting begins with the obligatory descriptions of the major races of Golarion. What is important to note is that each race has been given a unique treatment that is specific to how they operate in Golarion. For instance, in the Pathfinder Chronicles Campaign Setting, gnomes suffer from an affliction called the Bleaching. A gnome’s age is not tied to the passing of time. Instead, whenever a year passes by without the gnome experiencing new wonders, he advances one age category. Favored regions, preferred deities, names, and languages are given at the beginning of each racial entry. Each race has been given something that makes them feel like they belong to the world of Golarion. Each of the D&D 3.5 base classes is also given the Golarion treatment. Each class entry describes the general behavior and common expectations of representatives found in Golarion as well as which regions favor the class. Each entry begins with an alternative class feature, which give a Golarion flavor to the mechanics. Once through the Golarion perspective on Races and Classes, the book plunges into 2 or 4 page entries on the major (and minor) kingdoms, nations, and regions which appear alphabetically. Each entry begins with a coat of arms and statistics about the location including its alignment, capital (if any), notable settlements, ruler, type of government, dominant religions and languages. The entries include histories, political description, and brief details on locations of note. Each region also includes one or more feats for characters that have affinity for the region (either having been born there or lived there for an extended period of time). Here is where you find that real world familiarity that makes this setting click. Andoran represents the very American (at least the America of ages past) ideal about freedom and democracy. Cheliax embodies imperial fascism in the guise of diabolism, symbolizing British Imperialism and Nazi Germany. Galt and its named guillotines harkens to the days of the French Revolution while Quadira has the Ottoman Empire written all over it. Osiria is a direct reflection of ancient Egypt and the Mwangi Expanse is reminiscent of the rain forests of both Africa and South America. The Campaign Setting focuses on just the Inner Sea region of Golarion, which includes the two (out of eight total) continents of Avistan and Garund. Brief descriptions of the other land masses are given at the end of the chapter. The chapter begins with the introduction of twelve new domains introduced by the Campaign Setting. However, since the Pathfinder RPG has been released, this information is really only applicable if you are playing Dungeon & Dragons 3.5. Each deity receives a half page entry that begins with their holy symbol, portfolio, alignment, domains, favored weapon, centers of worship, and nationality. I think the most interesting concept is that there are not racial pantheons. The gods get a more complete treatment in the Gods & Magic supplement. Pathfinder has a cosmology similar to the Great Wheel planar composition of 3.5 D&D. At the center of everything you have the Material Plane and Positive Energy Plane at the center of the Inner Sphere. Overlapping these, through the Ethereal Plane, are their mirror opposites: Shadow Plane and Negative Energy Plane. The Material Plane is encased in 4 layers of Elemental Planes (Air, Water, Earth, and Fire) and then the Astral Plane which marks the beginning of the Outer Sphere. One the edge of the Astral Plane, before the universe is consumed by the infinite Abyss, reside the planes tied to alignments (Nirvana, Heaven, Elysium, Abbadon, Hell, The Maelstrom, Axis, and the Boneyard). Also in this chapter are brief descriptions of minor gods, devils, demons, and angels. The campaign setting also introduces four philosophies that are not tied to deities. The famous Pathfinder Society (the same group the organized play wing of the Pathfinder RPG), infamous Hellknights, deadly Red Mantis assassins, righteous Eagle Knights, and devious Apsis Consortium are laid out in this chapter. These organizations could serve as handy elements in a campaign to further the plot, either as resources and allies or as dangerous opponents. Also, a handful of less influential organizations are given a brief mention at the end. This is the largest chapter and its sections include History & Timeline, The Darklands (the Pathfinder version of the subterranean Underdark), Fauna, Flora, Languages, Lost Nations, Psionics, Technology, Trade, and Weather & Climate. There are also the more mechanic orientated sections of Domain Spells, Equipment, General Feats, and Prestige Classes (Harrower, Low Templar, Pathfinder Chronicler, Red Mantis Assassin, and Shackles Pirate). The Pathfinder Chronicles Campaign Setting provides a rough account of 10,001 years of history. It begins with the Earthfall event, when a massive meteor, the Starstone, called down from the stars by the Aboleth destroyed the Azlant (the first kingdom of men that appears to be inspired by Atlantis mythos). This event plunged Golarion into a literal and figurative Age of Darkness. Today, Golarion is in the Age of Lost Omens which was brought about by the death of Aroden (the god who was prophesied to return to Golarion upon the eve of mankind’s greatest triumph). None of the old prophecies are reliable and it is truly an age to make your own destiny. Current year is 4709, but was 4708 when the book was published. Time passes in Golarion just as it does in the real world. There are four appendices. The Pathfinder Chronicles Locations which details where the Adventure Paths published (at the campaign setting’s time of publication) take place. The much needed Pronunciation Guide (something EVERY fantasy supplement should have). There is the Rogues Gallery of NPCs for Game Masters. Even an appendix for Wandering Monsters is included. I have a few criticisms for the Pathfinder Chronicles Campaign Setting. The first criticism is that the book has an MSRP of $49.99, which is pretty expensive to me for a book with less than 260 pages. Also, there needed to be more maps. On the editing front, I encountered about 15 errors (but didn’t document them until I encountered 5 or 6). I also had some confusion surrounding the mechanics of the Shackles Pirate prestige class. They have the ability to grapple ships, but I wonder how to calculate the strength check is a character opposing? Is it the grappled ship’s strength or its crew’s? How do you determine the strength of a ship? There is a chart that shows the strengths of various classes of ships, but the table is really only for the mist ships that Shackles Pirates can create. Some further clarification would be nice. 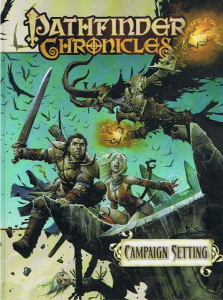 As I mentioned in my introduction, the Pathfinder Chronicles Campaign Setting is probably the best setting book I have read since the Iron Kingdoms from Privateer Press. Paizo wrangled an awesome crew of contributors to pen the setting and it shows (not to mention the awesome cover by Wayne Reynolds). The setting presents just the right amount of detail. Game Masters, and players, are given just enough information to spark the imagination while not nailing everything down and making the setting inflexible. As this setting matures, we’ll see if this continues to be the rule, but for now it feels very open and not oppressed by official canon. Just about any type of fantasy adventure can be found within the pages of the campaign setting. It is a veritable melting pot of genre. This book has been a valuable resource in creating a new campaign with my Co-GM. Since it also meshes nicely my new default RPG of choice, I highly recommend it. You can get it at Amazon for $31.49 ($18.50 off the cover price!). I feel exactly like you do about the Pathfinder setting : I just love it ! I can’t wait to wrap up my Shadowrun campaign and begin adventuring in Golarion. One thing though : you mentionned that the book (which is quite expensive, alright) doesn’t come with a map of the continent. Well, mine did, a huge poster size map on glossy paper. I bought my book in new condition, at my FLGS. Anyway, thanks for saying almost exactly what I think of this wonderful setting, that puts Forgotten Realms way behind in the dust. @Kyle: Really!? I bought mine through Amazon (new) and I didn’t get one… well, that’s frustrating. I’ll be sure to edit the post to reflect that and thanks for bringing it to my attention. Paizo recently announced that they will be revising and updating the campaign setting book to match the Pathfinder Roleplaying game rules. They are adding more content, removing a bit that is no longer relevant with the new Core Rulebook, and retitling it to reflect (hopefully) on the fact that other setting books will follow detailing other parts of the world. For those who like the setting, there will be just enough to make it worthwhile to get the new book as well, though James Jacobs states that the original book retains its usefulness. @Daeglin: Thanks for the head’s up.